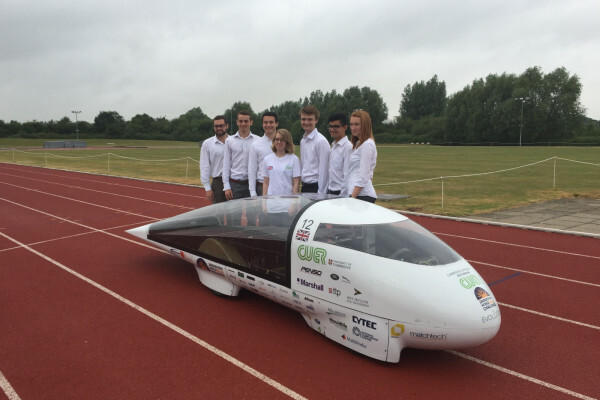 Graeham - The race is the World Solar Challenge. Every 2 years, teams from all over the world go to Australia and do a race, 3,000 kilometres from the north in Darwin to the south in Adelaide. There's about 40 teams that start at the beginning. Usually, between a quarter and a third finish at the end and it takes about 4 days entirely in solar power. Graihagh - Entirely in solar power. So surely, that gives you a number of obstacles to overcome from the get-go. Graeham - Yeah, absolutely. Our solar array gives you less power than you get in a hair dryer and we use it to propel our car with the driver in it at highway speeds. So there's a lot of challenges on the engineering side. Graihagh - Now, your car was ended in 2013 for the last race but it didn't quite make it even to the start line. What happened? Graeham - Yeah. We had a major disappointment last year unfortunately. Just suiting up to the race, we had some stability problems and we ended up having a little crash. Unfortunately, we had to withdraw from the race. Graihagh - It's very disappointing. And what's been done this year to overcome those stability issues? Graeham - So, we've lowered the weight of the car close to the ground, made it a bit wider and changed the dynamics of the car, so how the car is steered to keep it upright. Graihagh - So, you're feeling much more confident this year then. Graeham - Yeah, definitely. I think we've learned a lot from our last car and I have great expectations for this car. Female - The moment has come everyone. Here's our driver, Amy. Amy - Yup, thank you. Graihagh - As Amy and the solar-powered car, Evolution squeaked off down the race track, I found myself scrabbling to describe it. Its shape is rather futuristic. I could only liken it to a white helicopter without the propeller or the landing pads, that got stuck in some sort of time warp and the back end got super stretched. Simon Schofield, technical manager of the car thought it looked more like a teardrop/toothpaste tube. Toothpaste aside though, I was keen to understand why Simon and the team were feeling so confident especially since it had clouded over and begun to rain. Simon - One of the things that Cambridge University is very good at is being very innovative in the way that we design our cars. Most of the other teams have a very different design that looks more like what's called a table top design which means it's a large flat set of panels that face the sky and then there's a part that the driver sits in the middle of the car. So, our decision to go for something that's much more aerodynamic but has a smaller solar array is something that no other team has tried up to this point and is still quite an untested concept. So, we're very interested to see how it turns out in Australia. Graihagh - The solar panels to me aren't very big. I'm thinking about the solar panels we get next to a swimming pool. There's loads of them and even then the swimming pools are not that warm. You've got maybe 2 meters by half a meter worth of solar panel there. How are they so efficient? Simon - So, the solar cells are gallium arsenide cells. Gallium arsenide is a very good semiconductor to use for solar cells because it's a direct band gap semiconductor. That means that rather than needing phonons as well as photons in order to absorb light, you only need the photons and that means that more of the photons that hit the solar cells will actually be converted into electrons, turns into energy which allows you to power the battery. Graihagh - And I notice you've got a covering which is perfect because on a day like today, it's raining. I imagine you won't get as much rain in the outback. Does that not block some of the photons getting through? Simon - So, the canopy is about 95 per cent transmissive which does mean that we lose about 5 per cent. But the benefit of having it there is that it actually keeps the aerodynamics of the car extremely good. Amy - It is very small. I'm 5 foot 3. It's about the right size for me. Graihagh - We're standing in front of the car and I can just see a mass of wires and a removable steering wheel I notice, which you have to take on and off to get in and out of the car. What's it like to drive? Amy - It's quite different to driving a normal car. Accelerator and breaking on the steering wheel and then an emerging foot break on the floor. Graihagh - So, it hasn't got gears then. It's not like driving your regular manual car. Amy - No. Definitely, not. The power is direct to the motor so you just pull a trigger basically and it goes. Graihagh - And how are you feeling about the race in October? Amy - Feeling confident that we'll finish and do better than previously. I don't want to jinx it. Why don't people in Australia feel upside down?